So, you know that you have lined up a pretty fun time for you and your family this coming summer holidays, and would like to make sure that it will be yet another memorable year for everyone. 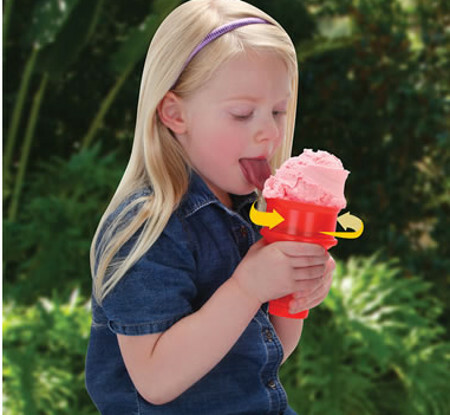 Other than the vacation spot of choice, you might want to figure out that feasting on the likes of summer delights such as ice cream is a must, so why not make the ice cream eating experience even more fun with the $24.95 Lazy Licker’s Spinning Ice Cream Cone? This happens to be a motorized ice cream cone which will enable one to enjoy the classic treat without tiresome head turning or wrist twisting, where a single push of a button on the cone handle will activate a 25-30 rpm rotating dish, making sloths and lazy humans alike happy – since you just need to put out your tongue to reap the benefits of each turn. There is even a built-in drip basin that provides permanent relief from sticky struggles, and the rotating dish is removable and dishwasher safe.